Party in Ibiza! Cheap flights to Ibiza from €42! Ryanair now offers cheap flights to Ibiza! 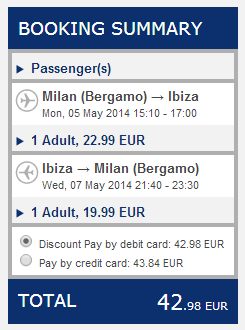 Return flights from Milan Bergamo to Ibiza are available from only €42! Milan is easily reachable with tens of flights from virtually any major airport in most European countries. Travel dates are at the beginning of May which is already warm enough to enjoy the sea and beaches of Ibiza. Price is valid if you travel with 10 kg cabin luggage. Many more dates and combinations are possible for higher prices.